Six Ways to Make Birthday Pages Sing! I used one of Mosaic Moments FREE downloads for my title and a journaling block poem. I printed CELEBRATE in ten colors, a slightly expanded rainbow array of bold bright colors. Then using the CELEBRATE letters I used a 1” square punch and punched one letter from each color and applied it to the bottom row of the White 12” x 12” Mosaic Moments Grid Paper. Next I took a 1” strip from each of the colors and ran them through a variety of embossing folders. Then cut to size, in this case I chose to cover three tiles (3 ¼”) for each color; you may like to alter the size of your candles. Adhere with dotto adhesive. Next, you’ll need to light those candles, and our Sticky Face Stickers will do the trick. Now with the 1” Sticky Face squares I used Martha Stewart’s gold glitter, which is a very fine blend and rubs onto the sticky surface very nicely. The result is a very smooth glimmer look. Then with my X-Acto knife I cut a diagonal to get two corner tiles for two flames. Taking 10 1” White Paper Tiles to match my background paper. I adhered the glitter half squares in the same corner for all and then to the page. Using a tile to match your background grid will help to give an open feel to the page. Next, I returned to my FREE printout for a poem block to begin my top edge. I chose to use red to carry the color pattern all the way to the top, but there were nine other colors to choose from…which will be perfect to have handy to do another birthday page with all the remaining pieces. Now I wanted a date to be included and chose a white on black year Four Letter Cornerstone and removed the black and replaced it with color tiles to match the pattern underneath each number. I also chose a birthday cake to fit my theme and the top right-hand corner. Again, I chose a white cake and substituted the base color black out for a 2.125” square of color from my last column color in the scheme. My final tip is the bling! I’ve been watching Paulina of Pretty Pink Posh play around with sequins to bring some extra light and bling to her cards, and thought I’d finally include them on a scrapbook page. Using a variety of colors to match my design, I picked just a few to scatter on the empty tiles, a few on the poem block, and a few more in the dots of the cake cornerstone. Don’t overdo it, make it look like confetti falling down. I used Alene’s Tacky Glue to adhere using only a dot of glue. So now it's up to you! Choose your color scheme, embossing folders, bling and photos and create your own melody! We'd love to have you share your work with us on our Facebook page or over at www.journella.com on the Story Board. This is Part 2 of March's guide to creating a page based on the popular science fiction book, "The Hitchhiker's Guide to the Galaxy." Last week we listed different ways to draw inspiration from the story and the science fiction genre. We love those famous words spoken by Buzz Lightyear - "To Infinity and Beyond!" Creating a science fiction themed page is a great time to go all out! You can have fun creating different cut outs and experimenting with different textures. 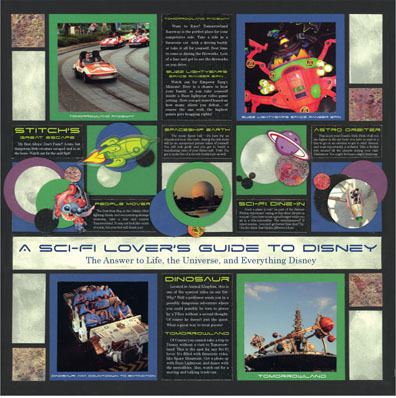 I used the following materials to create A Sci-Fi Lover's Guide to Disney" - Black Mosaic Moments 12x12 grid paper, and Huckleberry and Green Paper Tiles. Embellishments include: Black glitter Paper, Metallic Silver Chalk Ink, foil leaf on Sticky Face squares. I enjoyed testing products and using them in unconventional ways. Title: I was inspired by the Book Title (The Hitchhiker's Guide to the Galaxy) so I created my own version of the title - "A Sci-Fi Lover's Guide to Disney"
Colors: My main Colors were Black (Since it reminds me of images of outer space), Blue, Green, (I wanted to colors to brighten up the image since it is a more humorous story) and Silver (this reminds me of metals). I also included purple as an accent color to add a little whimsy to my page. Science Fiction Font: If you look at the main title, this is clearly a Science fiction inspired font. (This is Space Age, you can download it for free here.) The font alone says "this page is all about Science Fiction". Note: Use the Special fonts for your titles only - use a basic font for the rest of your journaling since it is easier to read. Phrases: I used a phrase often seen with this book ("The answer to Life, the Universe, and Everything: 42"), but made it ""The answer to Life, the Universe, and Everything Disney". I used this as a subtitle to let the viewer know this page is all about tips at Disney World. This fits with the overall theme of the page. Icons & Imagery: For this page I mainly used imagery of stars and planets - relating to travels in the galaxy. I used a glitter paper to represent the starry sky, and used several sizes of round punches to represent planets. Several of the circles were made by using Sticky Face Stickers and adding Foil leaves on them - this makes the circle look like little moons. This is close up shot to show some of the imagery. I have several circles representing planets. I also used special stickers to make certain images pop for a 3D look. 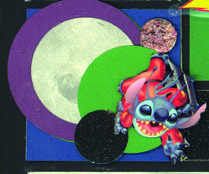 I wanted to make the character, a photo of Stitch (cut into a silhouette) look as if he is popping out at you! The Theme I incorporated into my page is based on a traveling theme. In "Hitchhiker's Guide," the main characters use an actual guide to help them during their travels. My page is a guide on how to have a Science Fiction Adventure at Disney World. Here I give tips and descriptions of each of the rides and entertainment. Books are a great source of inspiration. I love how choosing a book can help me to be more creative and use my imagination. Consider using your favorite sci-fi movie or book as inspiration for your next scrapbook layout. Adding a theme is fun and your page will stand out in your album since it is so unique! March continues its advance toward spring and of course, the flowers and showers of that time of year. Working on a rainbow technique using watercolors last week kept me thinking of ways to make the very most of this color palette in scrapbooking. So we’ll continue the theme with two more projects. Spring arrives on March 20th, and we are often buried in snow and windy weather with only hopes of warmer days, green grass and budding flowers. As the rhyme suggests April follows with showers and May with her flowers. I’m hoping that given this idea, you will be able to plan ahead to take wonderful spring photos and try this out for yourselves. I love taking photos of the flowers in my garden each year. I love to observe the details of each variety. Some photos are better than others and then there are some that are absolute favorites. So what do you do with them all? Wouldn’t you love to have a nice page of blooms to enjoy in your scrapbook or to mount on your living room wall? Let me show you one way to make your photos the star of the page and bring the rainbow in in a subtle way. Then let me take the same photos plus a few more along with a variety of papers from a coordinated pack and really let the colors of the rainbow playfully dance across your page. I have printed 25-2.125”squares of flowers in Red (3), Orange (3), Yellow (4), Blue (4) and Violet (6) shades. Additionally I included 5 green foliage plants/trees to represent the colors of the rainbow. ROY G BIV is an acronym for the sequence of hues commonly described as making up a rainbow: Red, Orange, Yellow, Green, Blue, Indigo and Violet and my guide for this collection. I cropped the photos in my photo editing program (ACDSee) that I wanted to include into squares focusing on eliminating anything that was distracting from the flower surroundings and saved them as a square keeping the original copy untouched. Then I used a template I had created in Print Shop 20, a program I’ve had forever and you probably do too, to print multiple photos at a time. To create a template begin with a blank 8.5 x 11” page and use the guide lines and rulers to create a page with 1” squares separated by 1/8” spaces. This general template allows me to print any photo to the exact size I want to cover the right amount of tiles, and is helpful for doing several economically on one 8.5” x 11” page. Once you create this template be sure to name it and save it to reuse again and again. With every project you create with it if you want to save those to print later, or another time, rename it something else to save the project and your template will remain original. For the larger squares I relied on my X-Acto knife, my Mosaic Moments Self-healing cutting mat, and metal cork backed ruler to trim them away from the sheet, but the 1” squares were easily punched out using an EK Success 1” punch to accomplish the task. I decided I really liked the way the colors of the photos popped off of a Black Mosaic Moments 12 x 12 Grid, and thought it helped to visualize the rainbow as I arranged the colors in order from the top left corner to the bottom right corner. Once again, following Tami’s philosophy of letting the photos you take be the focus, “to use…photos to decorate the pages,” you can see how stunning the colors can appear when presented this way. Taking the sheet of 1” printed squares and punching them out is the beginning. Next cut your paper selections into 1” strips. I used an 8x8” pad of coordinating papers (I chose The Basics by The Paper Studio from Hobby Lobby,) that had 5 patterns for each of the colors. One strip of each was more than enough. For this one I wanted a playful feel to the page and chose to go with the White 12” x 12” Mosaic Moments Grid Paper where the added white in the patterned papers added to the openness of the white space. Arrange your photos on your grid in a pattern or order that pleases your eye. Think of them first as a color and second as a flower; don’t be afraid to rearrange them until you have something that pleases you. Once all the photo colors are arranged begin with the red papers and cut a few 1” tiles from your 1” strips of paper. Keep each of the colors in the block area that you have planned for each color. Directional patterns need not remain in one direction only; stripes can be vertical or horizontal. Attach each tile with adhesive. You’re done!! Now, that wasn’t too hard. Do you like your results? Frame it! Or add it to your scrapbook for spring. If you work this pattern on a 6 x 6 or 8 x 8, you can incorporate that piece into a larger 12 x 12 layout. Maybe only use a portion of this technique on a page; maybe use it to create a frame around a few focal photos…the possibilities are endless. AND…don’t forget to share it with us on our Facebook page or on the Story Board at Journella.com!! A final note, while I have used flowers to build this floral rainbow, it’s a style you can accomplish with just about anything and a little planning, so why not search for the rainbow in your neighborhood? Thanks so much for dropping in, we'd love to get to know you too!